Tomorrow is the last day for a chance to receive a Steam key for our special holiday Christmas Paint Jobs DLC pack for free! You may ask yourself "How can I receive this special pack?" - it's all very simple! All you need to do is to earn at least one achievement on your World of Trucks profile before end of the day on December 3rd (CET). If you already have one or more achievements, you're all set. During the past two days, almost fifteen thousand people felt it was worth their time to grab an achievement... So if you don't have any yet, it's time to hurry to now! Get just one of them and a new Paint Job DLC pack will be yours! 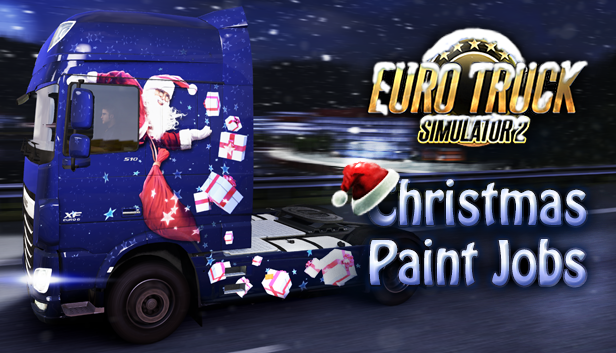 This Christmas special paint job pack is just the beginning of cool things to come: we have prepared even more holiday themed content for Euro Truck Simulator 2, so stay tuned for more information soon! Please note that only achievements on your World of Trucks profile count, as Steam Community achievements do not qualify in this event. The codes for Christmas Paint Job DLC will not be immediately available at the midnight deadline, you will be notified of the free key in your World of Trucks profile on Thursday morning. How can I earn this achivment? would it be possible then this package to buy for the money? so, we who have not Steam version, are pissed, right? ets2.lt has got a christmas-skin contest going and some look petty cool actually. Guess what, you dont need WoT nor Steam to download those. It's not like people can't download mods for free that are one hundred times better than SCS' paid-DLC either... Oh wait. "you will be notified of the free key in your World of Trucks profile on Thursday morning." That means that you will get the code on Thursday December 4th. Would be awesome but it's very very time consuming. They wount go for it. Really hope I get it. Holiday paint scheme really lighten the mood. Where do I redeem the code? I have an achievement. You will find your find your code in your World Of Trucks profile under the events tab. You can find it there on Thursday morning December 4th 2014. That key code you need to copy and paste into 'Steam -> Games -> Activate a Product on Steam'. That is the Games drop down menu in the top left of Steam. After this it will automatically add the free content to your account and will start to add this content to your ETS2 installation. Thanks =) we want snow!!! Fifteen thousand people... that's quite a lot. I know the game is still populare and you are still selling it all over the world. I'm afraid that can cause a delay with launching ATS... It will be two competing projects: ATS and ETS. I guess that before ATS you will launch Scandinavia DLC. It's a pity that everything it takes so long. Yes, I'll fill in my profile to get the paint job DLC, but afterwards I still will have absolutely zero incentive to log in. All your other achievements are about either screenshots or logging in frequently, and well, being not a particularly serious player of ETS2 who doesn't go crazy with mods, most of my screenshots have not even had a single view from anyone. That means all other achievements are completely unachievable for me. And this profile-filling achievement forces me to use a custom number plate, which I do not want to... That means I will definitely remove it (and therefore lose my only achievable achievement) as soon as I have my DLC. Surely, you are releasing this paint job for free to encourage us to use World of Trucks, but I for one simply don't have any reason to use it beyond getting freebies when you guys offer them. First, I would like to say that I appreciate that many of you have an interest in the "Steam" site. For you, Steam seems to be a great place for you to visit, and enjoy. And of course, I respect your freedom to have this experience. However, (despite my having a Steam account, and my ETS2 game registered there via product key), I must agree with the "non Steam" users who speak against the using of the Steam site. I keep my Steam uninstalled at all times while not using it. I install it ONLY to get what I want, then I go completely out of my way to get it back off my computer as quickly as possible. And it stays off my computer until the next time I really, really, really, MUST install it again to get something else. That's my choice. Just like many of you have the freedom of choice to use the site, I too have the freedom of choice to not use the site. What I find annoying, and some-what arrogant, is the constant feedback from some Steam users who seem to lack the ability of understanding that some people just may not share the same interests as them. Not only do they offer quick advice, explaining how easy it is to sign up and register the ETS2 game, but also just as quick is their criticism as they touch on accusations referring to pirated copies of the ETS2 game. I am greatly disappointed that I signed up for Steam and registered my ETS2 product key. It wouldn't be all that bad if I had the option to freely unregister my game from Steam without going through so much red tape. But I can't. I am seriously considering buying another copy of the ETS2 game so I can get a new product key.... which of course WILL NOT be registered with Steam. Again.... that's my choice. A choice I don't expect anyone else to adopt. In overview. Imagine what my frustration will be at seeing the continuence of annoying, some-what arrogant, and openly disrespectful people who seem to think they live in a world where everyone else must reform their very own lives to be exactly just like them.... accuse me of maybe having a pirated copy of ETS2 because I don't have its product key registered with Steam... when in reality, and of course oblivious to the world they live in.... I just may have receipts that prove that I have paid more money than they have in support of SCS. What would be nice to finally see... and yes... I agree that is pretty much a dream world... is that people get around to the simple basics of .... "Live and Let Live". At any rate. I think the using/non using of Steam should be a "freedom of choice" and not a decision forced on any of us by SCS. I think SCS should appreciate, and respect, that not all of its monetary supporters use their partner site, and allow for fair paritive services, and opportunities for all of its customers. That could seem like a fair arguement. However, the only thing I downloaded/used from Steam to date was the online multiplayer version of ETS2.... which I used for a very short time. I no longer use it for gameplay. So far Steam has nothing else that I want... therefore it would be installed for nothing. In a compartive agruement. I decided against the purchase of Sims 4 because of needing an "Origin" account. I lose out on Sims 4... but at least I don't have the Origin client on my computer. I prefer to keep these game client sites engine files off my computer. They are working on ATS and ETS2. There is a different team for ATS. It's useless to answer to this guy. He does anything but whining like a baby about ATS in EVERY SINGLE SCS POST! Seems that he don't know that SCS is an EUROPEAN software house, and that they need a lot of time to put together a game from scratch (like every Game House, I think...), so he can't pretend a beta now! And his comments are full of grammatical mistakes, so I don't think he's an American... just an ETS hater. Dude just stfu i hope they will ban you from buying ATS cuzz youre a prick ;) ATS will be next year so if you don't like it play another game, we dont care about crying baby's like you!! I must be in the 10% then, because there's no rush. 50 Keda, spoken once on the Optimus Prime ... of a look as it was edited by me in ETS2. I embrace. It's 4 dec already and i can't find any christmas paintjob dlc in my events page on world of trucks :( what's happening ? Thanks, key account appeared WoT. Got my Christmas Paint Jobs code. Thanks SCS! Thank you SCS for your great work! Thank you SCS, i have activated my " christmas gift key " already. Hope you release soon Scandinavian DLC, so i can buy it. - what about Euro Coach, not a single word about this anymore. Hey guys, Can you make the road signs reflective at night?? It would be nice! Keep going and I can't wait to see the Scandinavian DLC. Ihave another questions, in this DLC you will put the real sound of Iveco STRALIS and HI-WAY? And you will put the "RIGID TRUCK WITH SWAP BODY TRAILER, Unloadin process" ? SCS O Brasil que e merece os bitrens articulados!